The stylistic changes of the German wall pocket have gone from dainty cherubs and delicate flowers common in the mid nineteenth century to rich colors and abstract designs popular in the mid twentieth century. Wall pockets, also known as wall vases, are made to hang on a wall as a decorative piece. Most styles have a hole in the back to make them easy to hang. There are certain styles that have two handles, each with a hole, and a chord or wire that holds the wall vase. Wall pockets look wonderful either alone as a wall decoration or holding fresh, silk or dried flowers. Many collectors group pockets together for a nice display of their treasures. Companies well known for early German porcelain are Meissen, Rosenthal and Dresden. Others companies include Villeroy and Boch, Königliche Porzellan Manufaktur (KPM Berlin), and Furstenberg. 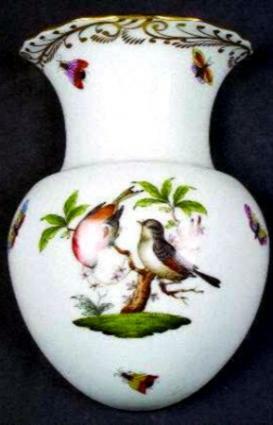 Each of these companies produced fine porcelain pieces that included wall pockets. First introduced at the Great Exhibition of 1851 in London, majolica was developed by Herbert Minton, a ceramist, and Leon Arnoux, a chemist. It is a soft earthenware ceramic that is fired several times at high temperatures. The glazes are rich in color and contain metal oxide giving the finished pieces their deeply brilliant and translucent colors. Several well known producers of German majolica wall pockets were Wilhelm Schiller and Sons, B. Bloch and Company and Julius Dressler. The wares of these companies were modeled on English majolica. However, the combinations of glaze colors were darker which is characteristic of pieces made in Central Europe. Ophelia Fine Arts: Antique Majolica and Palissy Wares. Scroll down the page to view these magnificent antique wall pockets. The other wall pockets pictured on this page are French pieces. Trilogy Antiques shows two magnificent Continental wall pockets, circa 1880. Scroll to the bottom of the page, they are the last two on the page. In the later 1950s wall pockets lost favor as decorative items in many homes but caught the interest of collectors. As home decor styles changed, wall pockets, often referred to at the time as part of the wall art collections, and were being made by West German companies. Also called art pottery many of these wall vases have mottled rich colors and cubist designs. Several West German companies that produced wall pockets from the 1960s-1970s were Keto, Kiechle and Ruscha Keramik. Even if you are not a collector of wall vases, hanging a German wall pocket in your home is a wonderful way of adding a touch of European charm.